Lord Adair Turner thinks he can convince policymakers around the world to embrace a renewable energy transition. Turner is no stranger to the workings of government. A member of the House of Lords, he was formerly chairman of the U.K.'s financial services regulator, its pension commission, and its national committee on climate change. Now Turner is co-chair of the Energy Transitions Commission (ETC), a group of leaders from the public and private sectors devoted to accelerating global economic growth while holding the rise in global temperatures well below 2 degrees Celsius. The group includes members from Royal Dutch Shell, mining company BHP Billiton, and General Electric Oil and Gas. Turner is enthusiastically promoting the organization's new report, Better Energy, Greater Prosperity, which was released last week. “We are now saying that even if [carbon capture and storage] continues to be uneconomic and even if nukes are high-cost, you can do it. And that is a new message, and it’s a message for many governments to make them feel confident that they can set off on aggressive renewables strategies," said Turner. Turner and other ETC commissioners -- a group that includes former Vice President Al Gore, Royal Dutch Shell Chairman Chad Holliday, and Indian climate and energy policy expert Dr. Ajay Mathur -- will be busy spreading this message to development banks, industry groups, individual companies and policymakers across the globe. The report maps out strategies for slicing global carbon emissions in half by 2040 compared to a business-as-usual scenario, while also ensuring that consumers in developing countries have sufficient supplies of affordable, clean and reliable energy needed to improve their quality of life. Turner says the group's research shows that both developing and developed countries should feel comfortable about accelerating their activities toward energy systems made up of 80 to 90 percent variable renewable sources because cost-effective storage and backup solutions are available. As part of its report, the ETC analyzed what it would require to provide the storage and flexibility needed to operate power systems made up largely of wind and solar in California, Germany, the Nordic region of Europe and the western state of Maharashtra, which includes Mumbai, in India. The conclusion: Even with conservative estimates about the decline in the cost of lithium-ion batteries, the cost of backup power is no barrier to solar- and wind-dominated energy systems. According to the report, the average cost of battery cells and packs has declined from $599 per kilowatt-hour in 2013 to $273 per kilowatt-hour in 2016. “That is not aggressive. That is not assuming breakthroughs in vanadium-flow technologies, but what could happen as a result of endless improvement through extra scale and fine-tuning of the technologies that exist,” said Turner. “If there are enough countries across the world that believe our analysis and commit to near-total-renewables systems, I’m absolutely confident the cost of batteries will end up way lower than we have assumed," he concluded. It's worth noting that some researchers have challenged such conclusions. A recent literature review of deep decarbonization plans found that it's more cost-effective to have a diverse range of technologies -- including renewables, short- and long-duration storage, CCS and nuclear -- rather than just mostly renewables like wind and solar and lithium-ion batteries. While affordable battery storage is critical to the viability of a renewable-dominated power system, the ETC report spells out larger goals and the group’s specific strategies to achieve them. In order for the world’s population to achieve a strong standard of living, the report estimates that per-person energy usage should be in the range of 80 to 100 gigajoules per year. Currently, the average Australian and American use over 200 gigajoules, while many in sub-Saharan Africa use only 20 gigajoules each per year. The second goal is to slice annual carbon emissions from the global energy system from 36 gigatons today to 20 gigatons by 2040 -- an amount that would be less than half of the 47 gigatons expected under a business-as-usual scenario. In order to achieve these two goals, the report’s authors believe two things have to happen. Economy-wide energy productivity must improve by 3 percent per year, compared to a historical rate of 1.7 percent. And the amount of energy supplied by zero-carbon sources must also grow at a pace far faster than envisioned by the Paris climate agreement in 2015. According to the ETC, the share of zero-carbon energy in the global mix must climb by 1 percent each year. To reach these goals, the ETC report outlines 4 transition strategies. To create a global power mix comprised of around 80 percent renewables by 2040, there must be aggressive decarbonization and electrification. Though electrification and decarbonization of global power sources will account for the vast majority of emissions reductions, efforts must begin today to decarbonize activities that currently cannot be cost-effectively electrified, such as steel and cement production. The report mentions multiple possibilities, including replacing fossil fuels with various types of bioenergy, the use of hydrogen as an energy carrier, and the deployment of CCS, including converting carbon dioxide into valuable products. There must also be more rapid improvements in energy productivity through increased electrification and improved efficiency in how energy-based goods and services are delivered. Finally, the report’s authors declare that the use of fossil fuels must be optimized, which means that coal must be eliminated as quickly as possible from the power systems of developed countries and that gas production must flatline beyond the 2020s. These transitions will require shifts in policy and investment. 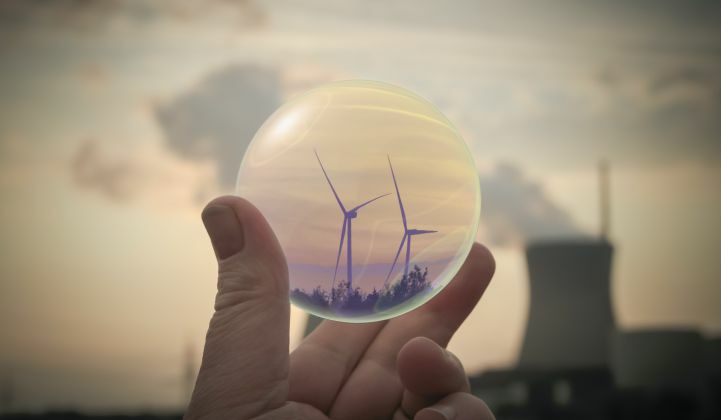 According to the report, a rapid move to a low-carbon economy will necessitate increased annual clean energy investments of between $300 billion and $600 billion. “In the context of global GDP running at around $80 trillion in 2017, and global annual investment at $20 trillion, additional investments of around $300 billion to $600 billion per annum do not pose a major macroeconomic challenge,” wrote the authors. But it does represent a big change. In the ETC’s scenario, total fossil fuel investment between now and 2030 would be approximately $3.7 trillion, while investments in renewables and other low-carbon technologies would be nearly $10 trillion. Public policy will also be an important enabler. To reach emissions reduction goals outlined in the report, a price on carbon should be about $50 per ton in the 2020s and $100 per ton by the 2030s. The elimination of subsidies for fossil fuels and a focus on R&D are important complementary policies. Because policymakers are an important audience for its work, the ETC commissioners plan to lobby political leaders around the world. Turner acknowledges that the climate-skeptical Trump administration likely will not be receptive. But even if Trump administration officials don’t accept the scientific consensus about the perils of a warming planet, Turner hopes they’d be willing to listen to his case about economic competitiveness. “We are going to see a world where more and more functions of the economy are going to be electrified. I think there are people who might say, 'Well, even if I’m not convinced by the climate-change argument, we have to take this seriously because otherwise we will miss out relative to China and the European Union, who take these trends seriously,'" said Turner. Even if there’s no traction with the federal government in the U.S., Turner believes there's still an eager audience among American business leaders and state and local policymakers. Turner is also hopeful that the ETC’s membership will be persuasive. The ETC is made up of a variety of stakeholders -- from the Rocky Mountain Institute to BlackRock to Royal Dutch Shell -- and the fact that they could reach consensus on a pathway forward should matter.